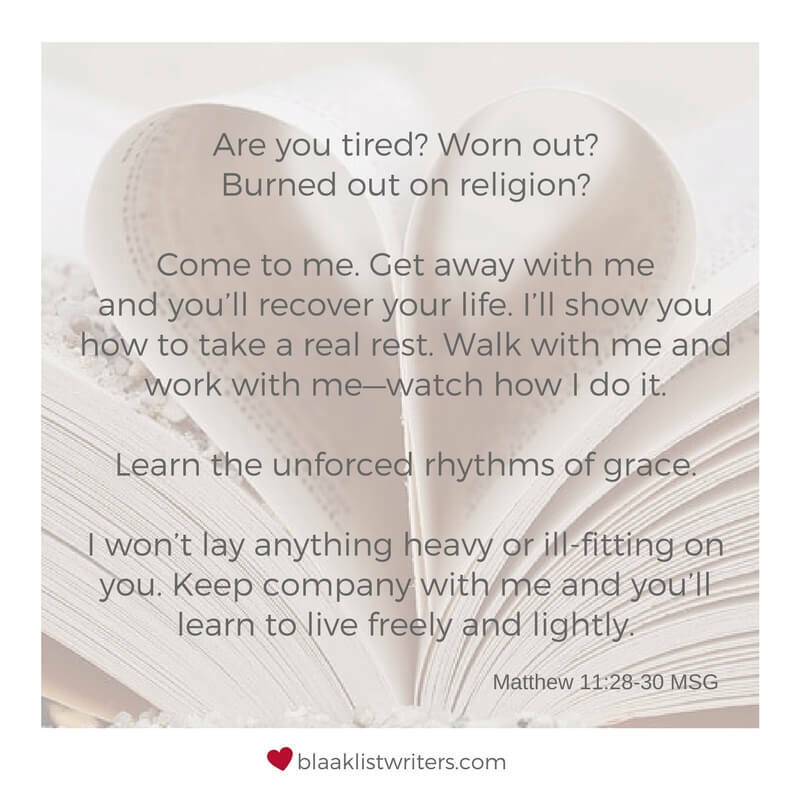 Walking in Unforced Rhythms – It’s a Marathon, not a Sprint! I laid before her a notepad detailing the six quadrants of my life. Do you get the irony there? Quadrants come in fours… I’ve been so busy that I had six quadrants on my page, all demanding my immediate attention and energy. No wonder I’ve been tired and stressed. Family, church, worship team, mentoring, Worship Academy students and their upcoming exams, writing clients in the middle of big projects, marketing my book, developing my next book (which ironically happens to be on Endurance), blogging, creativity, friends, prepping for the upcoming 31 Day writing challenge, and of course the online courses that I’m taking this year with Shaw Academy. // This isn’t even mentioning all of the other things I’d said “yes” to in the spur of the moment. How many of you know that we ALL need someone who can check our blind spots… the back of our hair, the back of our shirt, and the decisions we make under pressure? She and I examined and discussed everything on my list. What is important but can wait until later? What gives you gas in your tank? What is God saying right now? And then she said something that blew my mind. All of a sudden, the pressure to perform fell away. Well, OF COURSE, that makes sense! I had gotten so close to the trees that I couldn’t see the forest. My list had screamed for attention, but not everything on there was from God. Some of it was from my own expectations or expectations from other people, and some of it was simply there because of my silly decisions. Unforced Rhythms… what is God saying? Decisions are easy to make when you look at them like that. Thank God, He places us in families where we can depend on others to help us see our blind spots and navigate these moments. Independence only gets us into trouble when we can’t see clearly. Very quickly, I brought order to my schedule. Am I still busy? You betcha, but it’s not choking me anymore. Am I still going to write? Of course, writing is like gas in my tank. Writing is how I process my world. Am I going to kill myself to write and post every day of October like I did last year? Nope, not this year. It’s not the right season for that. This is my season for personal study, rocking my client projects, and making sure that my family is healthy. We are going to explore HOW to live this amazing life without burning out or losing our joy in the process. AND to make sure that happens, I’m giving myself unlimited time to do it! That means that some weeks you may only see a few posts from me, other weeks more. But over the next few months, we’ll slowly and methodically complete 31 Days. Do you also need help to slow down and breathe? Do you also need to sit with a trusted mentor and ask them to help you make some decisions about your schedule? My friends, it’s time to walk in the Unforced Rhythms of Grace. Every Friday, I join an inspiring group of writers to write for FIVE MINUTES on a one-word prompt. No editing. No revising. Just WRITE. This week, the prompt word was DEPEND. https://i2.wp.com/blaaklistwriters.com/wp-content/uploads/2017/09/Depend2.jpg?fit=560%2C315 315 560 Shauna Blaak http://blaaklistwriters.com/wp-content/uploads/2016/08/logo-really-long-2-1-300x75.jpg Shauna Blaak2017-09-30 13:49:402017-09-30 23:32:00Walking in Unforced Rhythms - It's a Marathon, not a Sprint! Thanks for sharing, Shauna! I decided to not participate this year, I’ve got too much going on and didn’t want to put myself under this pressure of finishing in 31 days. But I need to keep writing. So keep writing, no matter the pace! And may you, most of all, benefit from it!